You know, you can choose your friends, but you cannot choose your family. So much of what we become in life is rooted to what we experienced growing up and our immediate family (genetics included). Our thoughts, actions, knee-jerk reactions, fears and general opinions in life are shaped by those that were closest to us in our formative years. There's nothing quite like catching yourself, mid-rant, acting EXACTLY in the same manner we hated our parents acting, all the sounding just like them as well, and being completely helpless to change in the moment! Sometimes it's not a bad thing you're catching; I often find myself making a simple little gesture, coughing, moving my hand, just looking at my hand (my hands are exactly the same as my Mother's were) and feeling utterly possessed by Mom. This, in a nutshell is what this book is about, the way life turns out, and how we are shaped by our family. There is good, there is bad, there is crap we'd just as soon live without given our druthers!! But, all in all, the people you can most often count on to be in your corner when required, are the people who tortured you in your youth! 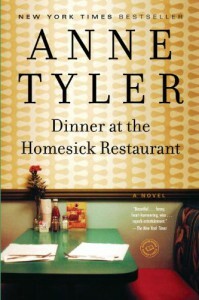 I found a lot of my own life in the pages of this book and I love the way Ms. Tyler gets that across. Her story-telling is clean and crisp, perhaps there are some things left unanswered, but the crux of the issues are dealt with. I thoroughly enjoyed this book, the second of hers I've read, but certainly not the last!